New Delhi: In the sacred town of Melukote, approximately 130 kilometers from Bengaluru, exists the largest ancient lake – Panchakalyani, the most visited tourist spot in the district Mandya. The lake, one of the numerous water bodies situated on a hill top through which rain water has been harnessed for many centuries, is an ancient gem for Karnataka and was historically a source of water for irrigation and consumption purposes. Over the years, however, the lake got deeply polluted, due to indiscriminate dumping of waste and plastic. IT firm Infosys’ philanthropic arm, Infosys foundation on Wednesday, announced its plan to revive the lake and restore its water. The foundation will restore the lake by cleaning the tank, removing silt and waste deposit. The foundation will also ensure structural and chemical conservation of the Panchakalyani and a nearby tank called the Ganeshan Honda, reconnecting the existing canals, and building a compound wall. 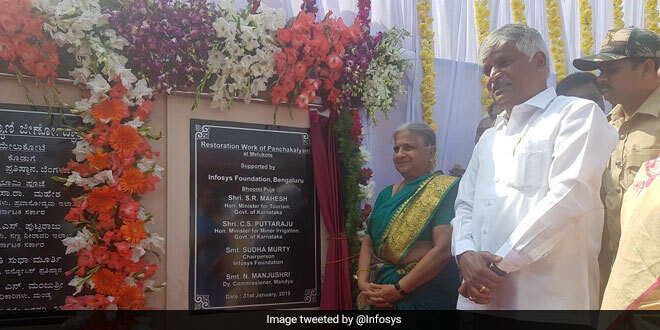 The restoration project was announced by the Infosys Chairperson Sudha Murti in the presence of Government of Karnataka’s Tourism Minister, S.R. Mahesh and the Minister for Minor Irrigation, C.S. Puttaraju. “Melukote was patronised by the great empires of Hoysala and Vijayanagara, and the Wodeyars of the Kingdom of Mysore,” said Mrs. Murty, talking about the history of the lake and the project. She further asserted that it’s the duty all the citizens to preserve the heritage structures created by our ancestors as they are the testimony of the glorious past. The restoration project is important to improve the water quality of the lake and bring back balance in the natural ecosystem of Melukote. This endeavor will not only create awareness to preserve but also protect our rich legacy for future generations. Temple lakes have been a major source of water in this area. As a monument, this temple complex also attracts many tourists from around the state. We are proud that Infosys Foundation has come forward to help restore this lake and revive a part of ancient history. The Infosys Foundation has been contributing towards preserving ancient culture heritage of India for decades. Established in 1996, the Infosys Foundation supports programs in the areas of rural development, arts and culture, and destitute care among others.